George Osborne is expected to announce a tax raid this week on the pensions of Britain’s highest earners, as he faces a battle with the Liberal Democrats to push through a welfare payments freeze. The move has been reportedly been vetoed by his Lib Dem Cabinet colleagues Nick Clegg and Vince Cable – and it has also been claimed stamp duty on multi-million-pound home purchases could rise. It comes as Mr Osborne today announced a heavier crackdown on tax avoidance by global firms with British operations in the wake of widespread condemnation of Starbucks, Google and Amazon. The Chancellor said he plans to bolster the Inland Revenue team that deals with multinationals after outrage following revelations that the three huge firms pay little or no corporation tax in the UK. He also admitted that the financial pain in Britain will continue to go on even longer than expected. Mr Osborne told BBC One’s Andrew Marr Show: ‘I am going to be announcing tomorrow extra investment in the part of the Inland Revenue that tackles tax avoidance by multinational companies. He said he will also ensure ‘internationally we have the right rules and it is actually Britain who has been working with Germany and France to get those rules on the international table’. Mr Osborne added: ‘It will be a big priority for the G7, G8, which we host next year. So we are doing those things but let me just say we can’t tackle this by pricing Britain out of the world economy. ‘If we make our taxes less competitive that will just mean more companies stay out of Britain’. Starbucks, which has more than 700 outlets in Britain, is understood to have met with HM Revenue & Customs following a customer boycott to discuss increasing the tax it pays. Mr Osborne’s plans come as it emerged today – after he hosted a private tour of Downing Street for Dr Dre last month – that one of the US rapper’s firms has a low UK tax liability thanks to its structure, reported the Sunday Times. Mr Osborne also admitted it was taking longer for Britain to recover from the financial crisis than he hoped today amid warnings that the Government would miss its key economic targets. ‘We had two targets, one was to get debt share falling as a share of national income by 2015/16 and also to balance the current budget,’ he told The Andrew Marr Show. Government sources say the Chancellor could announce the dole and other state handouts may go up by more than one per cent – close to the rise in earnings – after the Lib Dems claimed a freeze would be ‘cruel’ to the poor. It would mean he would save only half the £4billion he had hoped to get over the next two years to help dig the UK out of the red. The Chancellor, strongly backed by Work and Pensions Secretary Iain Duncan Smith, wanted to freeze most state benefits, with pensions and disability the main exceptions, to try to cut the Government’s mounting deficit. Instead, he faces having to agree to a rise of about one per cent to win Lib Dem approval for his Autumn Statement on Wednesday. Welfare payments usually go up in line with prices. But last year that resulted in a massive five per cent leap, while workers had to make do with pay rises of less than half that. 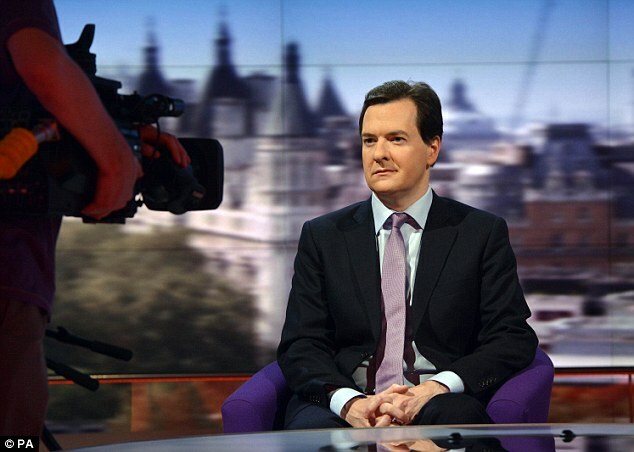 Mr Osborne argued that it was grossly unfair for the income of those out of work to go up by more than those in work. Immediately after the five per cent benefit rise, inflation fell dramatically. He and Mr Duncan Smith wanted to redress the balance – and save £4 billion – by using the Autumn Statement to announce a freeze of key benefits for two years. An increase of more than one per cent would be a setback to Mr Osborne’s publicly stated aim of reducing the welfare budget by £10 billion over the next five years. Conservative officials denied they had caved in, claiming that a one per cent rise was ‘a major improvement’ on last year’s five per cent. And welfare campaigners are certain to complain that it represents a real-terms cut in the standard of living for those on benefits. Treasury sources last night said that no final decision had been made, though the Lib Dems claim they have won a key concession in the Coalition tug-of-war over the Autumn Statement. Mr Clegg dug his heels in over the welfare freeze plan after David Cameron objected to the Lib Dems’ demand for a ‘mansion tax’ on homes worth more than £1million. The Chancellor was prepared to accept a watered-down version of the mansion tax in return for a welfare freeze, but Mr Cameron complained it would hit Tory voters in the Home Counties, where property prices are high. Mr Osborne told The Andrew Marr Show this morning that he would stick with his deficit-reduction programme when he presents a half-yearly fiscal statement, despite weak economic growth. ‘It’s clearly taking longer to deal with Britain’s debts, it’s clearly taking longer to recover from the financial crisis than anyone would have hoped, but (to turn back now) would be a complete disaster,’ he told the BBC One show. Mr Osborne is also understood to have shelved plans to withdraw housing benefit for the under-25s, which would have saved £1.5 billion, after Lib Dem objections led by Business Secretary Mr Cable. Lib Dem anger over Tory welfare cuts surfaced last month when former Lib Dem Minister Sarah Teather denounced them as ‘immoral’. Mr Osborne is expected to unveil other measures to meet Lib Dem calls for the well-off to pay more tax. But Government sources say Lib Dem plans to slash pension tax relief for high-earners from £50,000 to £30,000 have been turned down. They refused to comment on claims that stamp duty on multi-million-pound home purchases could be increased. The cost of welfare spending has surged by almost eight per cent in the past year, far outpacing the rise in average pay. Total welfare spending, including pensions, has risen 15 per cent over the past three years. Shadow Chancellor Ed Balls said it was time to ‘change the medicine, or change the doctor’. Mr Balls repeated his calls for the Government to use funds from the 4G auction of mobile airwaves to build 100,000 affordable homes and create hundreds of thousands of jobs. He also wants stamp duty cut for first-time buyers as well as a tax on bankers’ bonuses to fund a jobs guarantee for every young person out of work for over a year. Meanwhile Mr Osborne has been told ahead of his Autumn Statement that he must renege on his debt targets or hit households and businesses with further harsh austerity measures. With Government borrowing on course to overshoot official forecasts and the economic recovery struggling to take off, experts warned the Chancellor has been left with little room for manoeuvre. Independent tax and spending watchdog, the Office for Budget Responsibility, will increase the pressure by slashing its growth forecasts and predicting borrowing will be billions of pounds higher over the next five years than previously expected. Against this bleak backdrop, experts said the Chancellor will have to put back his goal to cut the nation’s debt as a percentage of gross domestic product in 2015/2016 or face the unpopular decision of further spending cuts and tax rises. The Institute for Fiscal Studies warned a VAT hike from 20 per cent to 25 per cent may be required to tackle the nation’s debt, which at the end of October was £1.1 trillion, equal to 67.9 per cent of GDP. TUC general secretary Brendan Barber said: ‘The Chancellor’s self-defeating austerity plan is causing borrowing to rise and the economy to stagnate. Labour’s former chancellor Alistair Darling accused Mr Osborne of having a ‘bankruptcy of ideas’ over how to generate growth. He told Sky News that the Chancellor was ‘wildly off all his targets’ for cutting the record budget deficit and urged new announcements in the Autumn Statement for major engineering projects. ‘It strikes at his very credibility and the credibility of this government’s economic judgment,’ Mr Darling said. Mr Darling said that instead of plans for growth, ‘you have got a complete bankruptcy of ideas’. Last week the Institute for Fiscal Studies said the current squeeze on public spending may have to last until 2018, and it said the Chancellor will be forced to announce more cuts and tax rises if he is to meet debt and deficit targets. Labour leader Ed Miliband described Mr Osborne’s U-turn Budget as an ‘omnishambles’ in the House of Commons in April – and it was named word of the year by the Oxford University Press last month.